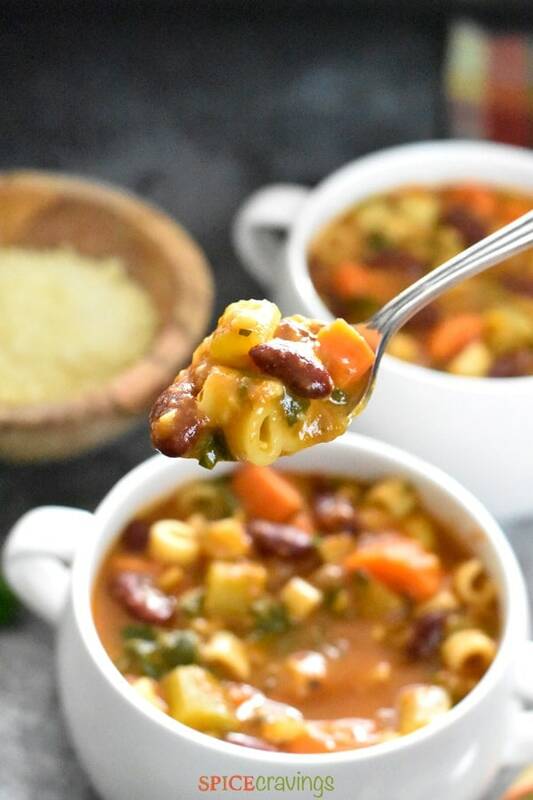 If you’re looking for a quick comfort meal, make this hearty and tasty Italian pasta and beans soup, called Pasta Fagioli, or, Pasta e Fagioli. Pronounced as Pasta Fazool, which literally means pasta and beans, this tomato based soup is heaven on a cold winter evening. Soups are a lifesaver, especially when it’s cold and wet outside. On top of that, if you have a cold, nothing feels more soothing than a bowl of hot soup. This recipe comes together pretty easily. I chop up some root vegetables like carrots, celery, onions and garlic, add vegetable broth to the pot, some Italian seasoning, a few extra ingredients and pressure cook everything with pasta and beans. And just like that, this meal comes together in under 30 minutes. 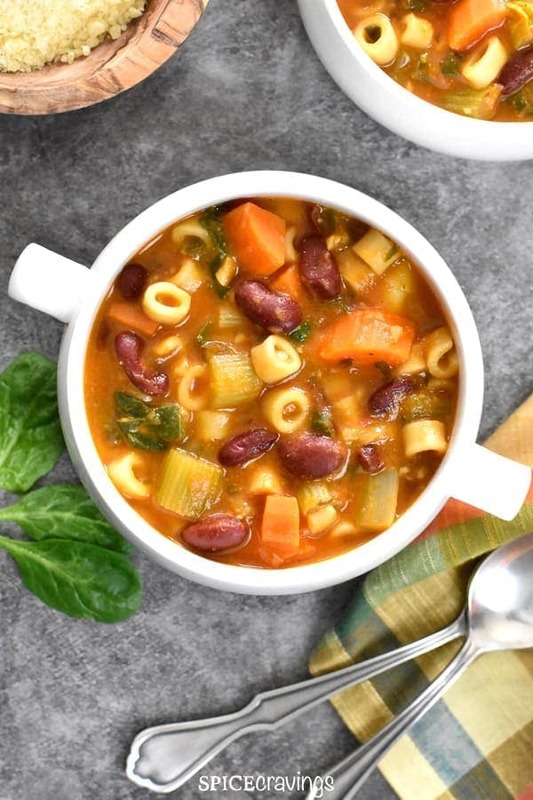 What is the Difference Between Minestrone and Pasta e Fagioli? Lot of people mix these two soups. That’s because there are some common elements in both, like, pasta, beans, root vegetables. 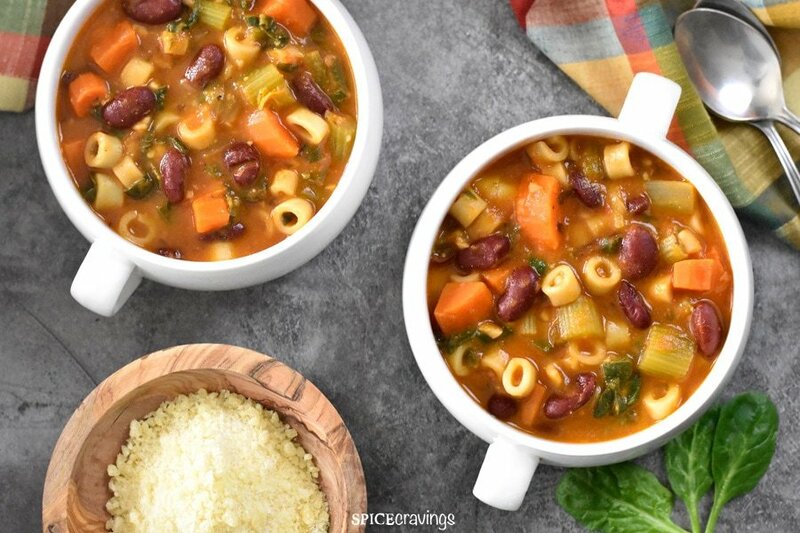 The big difference between the two is that Minestrone Soup generally contains other vegetables too, like squash, zucchini etc. 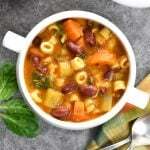 I also find Pasta Fagioli to have a more robust tomato flavor, as compared to Minestrone. That being said, if you like one, you’re more than likely to like the other one too. 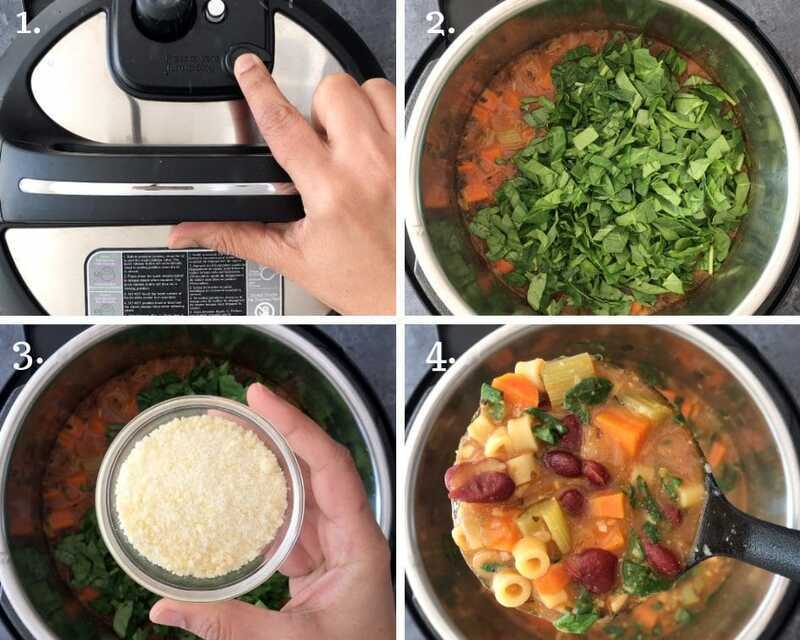 Check out the detailed recipe for Instant Pot Minestrone Soup. Meal preps are a big help for hectic lives. Whenever I making soup, I like to make a double batch and freeze some for another meal. And believe me, it always comes in handy. The only ingredient in this soup that doesn’t freeze well is pasta. Pasta tends to get super mushy when defrosted, in a very unappetizing way. So when I make a double batch of this soup, I skip the pasta. I boil some pasta on the stove, and add it to that day’s dinner portion, and freeze the remaining soup. I find myself making more and more Dump & Start recipes now. It works better for our crazy schedules and reduces our dependence on take-outs. 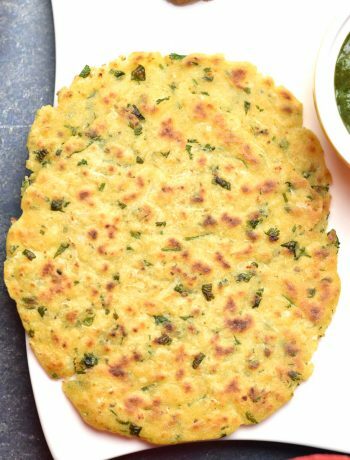 When testing out a dump & start recipe, I always make a batch the traditional way, by sautéing and all, and then compare the results with my family and friends. 9 out of 10 times, we can’t tell the difference between the two. That’s because pressure cooking causes the ingredients to release their natural flavors and sugars, and infuse with one another. Which is why, it works great for making soups, curries and stews. 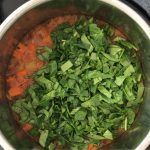 In this soup, I dump everything except spinach and parmesan cheese in the Instant Pot, hit ‘start’, and forget about it. After cooking, I add spinach and cheese and we’re done. 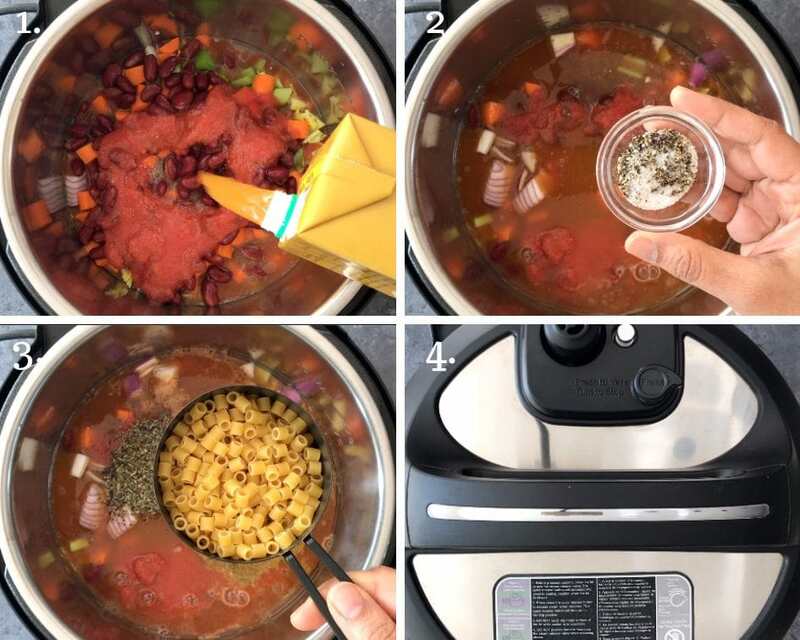 Here are the easy steps to make this delicious Pasta Fazool using an Instant Pot. Step 1: Turn on Saute while you add all the ingredients. This warms up the broth while you’re assembling the soup, and cuts short the pressure building time. This is optional, but does save a few minutes. Add all ingredients in the pot, except spinach and cheese. Turn off Saute. Step 2: Pressure cook 4 mins at Manual/Pressure cook, or ‘Soup’ setting. If you are using another shape of pasta, check the notes for cooking time adjustment. Step 3: When the pressure cooking time is done, wait 5 mins (NPR 5), after which do a quick release (QR). That means release the pressure manually, by turning the vent to ‘venting’ position in Instant Pot DUO, or, pressing down the pressure valve in Instant Pot ULTRA. Waiting 5 minutes reduces the chance of any soup from leaking through the valve while releasing pressure. Step 4: Stir in chopped spinach and parmesan cheese. Let the soup sit for a 3-4 minutes, then serve warm. Step 1: Heat a wide soup-pot or dutch oven on medium-high heat. Add all the ingredients, except spinach and parmesan cheese. Bring it to a simmer, reduce heat to medium, cover and cook for the recommended time for your pasta choice. Step 2: When pasta is cooked all the way through, add spinach and grated parmesan cheese. Let the soup sit for a 3-4 minutes, then serve warm. 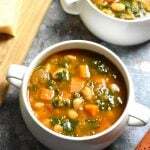 Beans: You can use Northern beans or Cannellini beans beans instead or Kidney Beans. 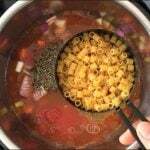 Pasta: In this recipe I have used ditalini pasta, but any short pasta, like shell, orzo, macaroni, works great in this recipe. If using any other pasta shape in this recipe, to calculate the cook time, half the lower number in the suggested cook time on the box, and subtract 1 minute from that. Veggies: I add the basic root vegetables, carrots, onions and celery, but you can add whatever you like. In the past, I’ve had success with parsnips, potato (red, gold, purple), turnips, leeks. As for the greens, I keep switching between spinach, kale, swiss chard (add it with all ingredients). 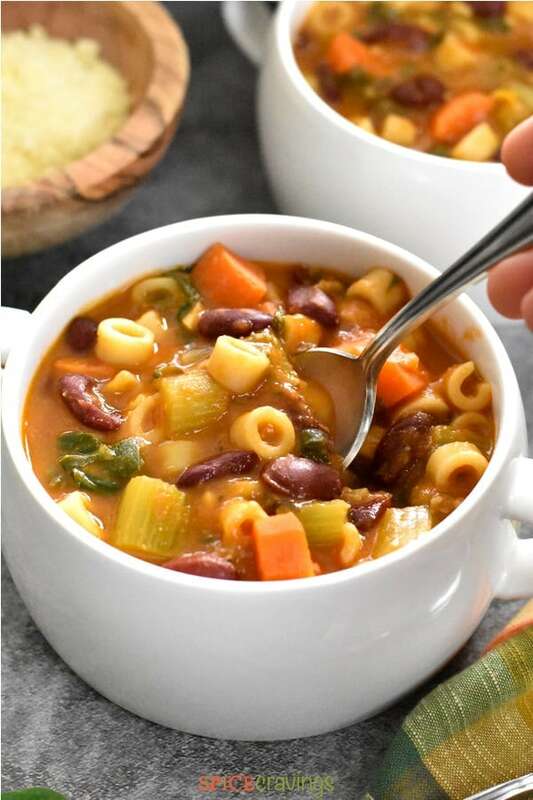 Dump & start recipe for a quick & tasty Italian vegetarian soup, Pasta Fagioli. This hearty soup is made by simmering pasta & beans in a rich tomato broth. 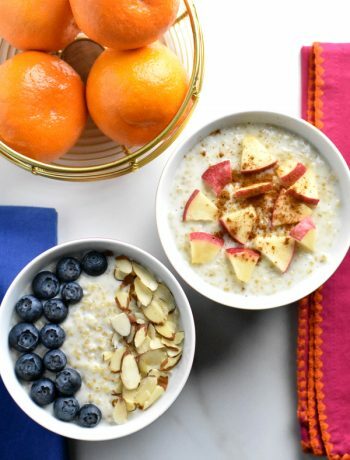 This easy meal can be made in an Instant Pot or stove, and is ready in 30 minutes! Turn on Saute while you add all the ingredients. This warms up the broth while you’re assembling the soup, and cuts short the pressure building time. This is optional, but does save a few minutes. Add all ingredients in the pot, except spinach and cheese. Turn off Saute. Pressure cook 4 mins at Manual/Pressure cook, or ‘Soup’ setting. If you are using another shape of pasta, check the notes for cooking time adjustment. When the pressure cooking time is done, wait 5 mins (NPR 5), after which do a quick release (QR). 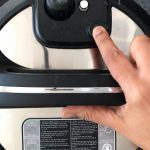 That means release the pressure manually, by turning the vent to ‘venting’ position in Instant Pot DUO, or, pressing down the pressure valve in Instant Pot ULTRA. Waiting 5 minutes reduces the chance of any soup from leaking through the valve while releasing pressure. Stir in chopped spinach and parmesan cheese and check for seasoning. Let the soup sit for a 3-4 minutes, then serve warm. Heat a wide soup-pot or dutch oven on medium-high heat. Add all the ingredients, except spinach and parmesan cheese. Bring it to a simmer, reduce heat to medium, cover and cook for the recommended time for your pasta choice. When pasta is cooked all the way through, add spinach and grated parmesan cheese. Let the soup sit for a 3-4 minutes, then serve warm. 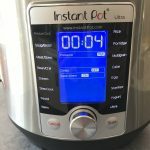 This recipe has been tested in a 3 qt and 6 qt Instant Pot. 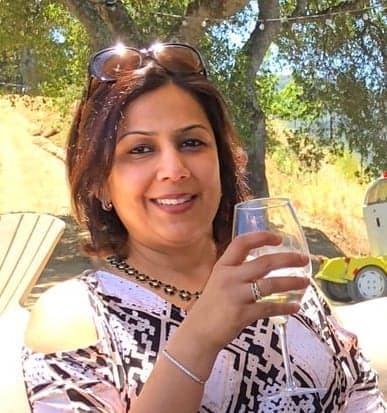 Tomatoes: I like using crushed or pureed tomatoes in this recipe for smooth texture, but you can use regular diced tomatoes as well. Pasta shapes: Is using any other pasta shape in this recipe, to calculate the cook time, half the lower number in the suggested cook time on the box, and subtract 1 minute from that.